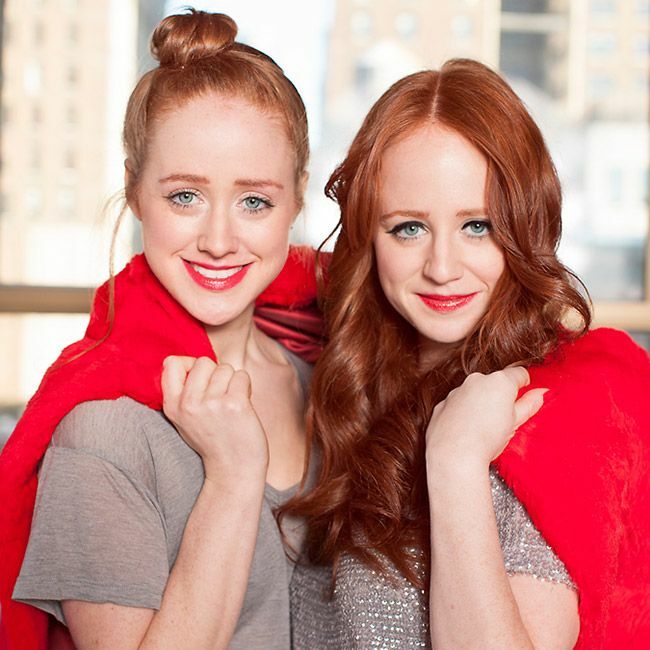 Co-Founders of the ultimate redhead resource, How to be a Redhead. Stephanie: The biggest question we get asked is, “How do I keep my red hair from fading?” We actually had to set up an entire section of our website, called ‘Get Vibrant’, to assist women with this question. Adrienne and I were both born with the same color hair, but as I got older, my hair turned strawberry blonde. I’m always using certain products to keep my hair vibrant. First and foremost, we love Davines Alchemic Red Shampoo/Conditioner. It naturally deposits color in and the product has never irritated my scalp — a common problem amongst redheads due to our sensitive skin. We also love Pureology’s Reviving Red Hair Care Line. Stephanie: When the summer comes around and my hair is fading, I will go to our hairstylist and get a clear glaze. It gently lifts my hair up to its natural color and makes it more vibrant. Adrienne: Make sure to always use sulfate-free shampoo if you aren’t using a color depositing shampoo. The chemicals in non-sulfate free products can strip hair (natural or ‘by choice’) and no redhead wants that! Adrienne: We always suggest using natural products to refrain from irritations and breakouts because redheads do have more sensitive skin. We love skin lines like Deep Steep, Alba and Fresh. I can break out in an instant if a product isn’t ‘redhead friendly’ and I know most redheads feel my pain. We always suggest reading the ingredients of a product, just like you do at a grocery store. If you can’t pronounce it, you probably don’t want to apply it to your skin. On HowtobeaRedhead.com, all products recommended are ‘redhead friendly,’ meaning they’ve been tested on a redhead for a minimum of 10 days. Stephanie: As a rule of thumb, if you can apply lotion to your body and it’s 100% natural, you probably can use it on your face too. Before we try a new face lotion, we always apply it to our arms to see how our skin reacts. We’ll test it for a few days before we add it to our daily regimen. Adrienne: Avoid sulfates and chemical-heavy products. It’s not worth the breakout. Nowadays you can find natural products in drugstores/convenience stores; spend the extra money and invest in your skin and hair. Many people don’t know, but Stephanie and I have very curly hair. It comes from our Italian side and so we can both attest that you can have a vibrant red and defined curls. The secret is using natural product lines and keeping your hair healthy. We are always applying Avocado and/or Olive Oil masks to our hair, we use sulfate-free shampoo/conditioners and on the days we rock curls, we love Kenra Professional’s Curl Defining Creme. Adrienne: It’s amazing how a little eyebrow filler can make the face defined and make red hair pop. Stephanie: We use to be apprehensive about rocking a bold lip. In fact, back in our high school days we tried to make our lips as pale as possible because we didn’t think redheads could wear lipstick! Boy, we were wrong. By the time we got to college, we started experimenting with bright lips and we’ve never turned back. Nothing makes us feel more beautiful and we’re so happy to see celebrities like Julianne Moore & Juessica Chastain wearing bold lips. Adrienne: We always suggest lipsticks with a blue undertone, it is classic and complements any shade of red hair. Redheads can really wear any color, but have to make sure to adjust other makeup to complement the look. For instance, if you’re rockin’ a heavy lip, go lighter on the eyes for an natural look.